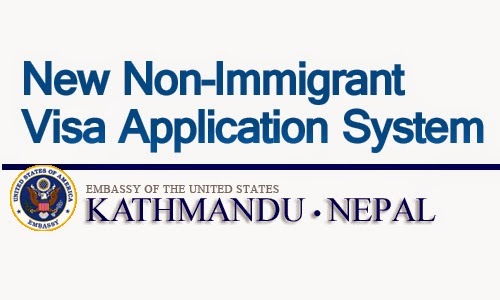 The Embassy of the United States of America in Kathmandu, Nepal will transition to a new fee payment, appointment and document delivery service for the non-immigrant visa unit as of September 15, 2014. (There will be no change to the Embassy’s procedures for handling immigrant and diversity visas.) This new non-immigrant visa system, which is being implemented in phases at U.S. Embassies and Consulates worldwide, is designed to be more comprehensive and user-friendly. It replaces the current system of paying application fees and making a visa interview appointment at Nabil Bank locations in Nepal. In addition to the new online system, there will be a new call center with more hours for applicants to obtain information by phone, as well as by email. There is no charge for the call other than normal charges for a call within Nepal. Starting September 15, full information about the various types of non-immigrant visas to the United States, as well as who is required to apply for a visa, will be available at http://www.ustraveldocs.com/np. The non-immigrant visa application form, Form DS-160, must be completed on-line. Please see https://ceac.state.gov/genniv. Please be sure to print the confirmation page once you have completed the form. Starting September 15, Nepal Investment Bank Limited will be the only bank at which you can pay the fee for a non-immigrant visa appointment. On that date, Nabil Bank will no longer be able to accept visa application fees. For full information on how to pay your fee at Nepal Investment Bank Limited, including printing of the required deposit slip for making your payment, please see http://www.ustraveldocs.com/np. Starting September 15, applicants will be required to book their visa interview appointments online at http://www.ustraveldocs.com/np. Alternatively, an applicant can book a visa interview appointment by calling our new call center for non-immigrant visa inquiries (see inquiries information below). You can only book an appointment after you have paid the fee at Nepal Investment Bank Limited, and you have received a code number from the bank, which will be printed on your receipt. In many cases, the code will not be “activated” allowing you to make an appointment until the next business day. Applicants who already paid an application fee under the old system with Nabil Bank, and were provided an appointment by Nabil Bank, should keep that appointment. Any request to expedite or postpone an appointment made by Nabil Bank should be directed to consktm@state.gov. In your e-mail, please indicate that you made your appointment through Nabil Bank. For anyone who makes an appointment through the new system, and whose visa is approved at the time of the interview, passports will no longer be held at the U.S. Embassy for collection. Rather, passports will be provided to Nepal Investment Bank Limited, where you can retrieve your passport with visa. When you make your appointment, you will be permitted to select from six different Nepal Investment Bank Limited locations across Nepal. Passports for applicants who made an appointment under the old system will still be held at the U.S. Embassy for collection. With respect to any non-immigrant visa case for which the interview application fee was paid on or before September 14, 2014 at Nabil Bank, please direct your inquiries to consktm@state.gov. Any inquiries regarding immigrant and diversity visas, as well as asylum/refugee follow-to-join cases, can also be directed to consktm@state.gov. With respect to any non-immigrant visa case for which the interview application fee was paid on or after September 15, 2014 at Nepal Investment Bank Limited, please direct your inquiries to support-nepal@ustraveldocs.com. Starting September 15, 2014, applicants may also make inquiries and schedule appointments by calling our new call center, Monday through Friday from 8 am to 8 pm, at 1 800 001 0103. Callers in the United States may also dial (703) 988-3428. Any inquiries for these non-immigrant visa cases sent to consktm@state.gov will not be answered. For a limited time after September 15, 2014, the Embassy will continue to take telephone inquiries about non-immigrant visas Monday through Friday from 9 am to 11 am at 423 4500. Please select “non-immigrant visas” from the recorded menu. The Embassy will also continue to take in-person inquiries about non-immigrant visas for a limited time on Tuesdays and Wednesdays from 2 – 4 pm. The Embassy recommends that visa applicants avoid the use of travel agents and visa consultancies, but understands that these businesses can provide services that some applicants find convenient. Travel agents and visa consultancies should carefully review the portion of the new website http://www.ustraveldocs.com/np, clicking on the section “Travel Coordinator” under “Local Visa Programs” to understand how they can use the new system to facilitate visa appointments for their clients.